Birds are chosen as pets for various reasons. From the wide range of vibrant colors to being extremely intelligent, they are welcomed additions to any family. Birds can be relatively low maintenance. But this shouldn’t be taken as a pass to skimp on keeping your pet happy and singing. 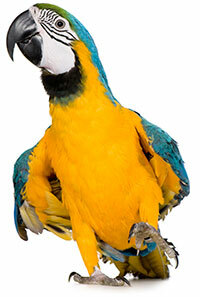 The staff at Suncoast Pets is well-prepared and knowledgable with our feathered friends. When deciding on what bird would suit you, simply ask to get a full understanding of each breed offered. 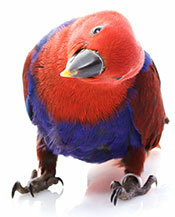 Proper hygiene is vital to the health of birds. Which is why it’s important to use the right bird supplies for mite and lice protection to clean and disinfect their cages and toys, and for proper grooming and bathing. No matter which breed you have, support the health and hygiene of your birds with proper bird cages or coops, food and supplies. Of course, Suncoast Pets can help in all of these areas. In addition to proper hygiene, food choice is crucial as well. There are various types of bird seed blends and treats, such as honey bars, mixed nut and tropical fruit, veggie treats, as well as some that are fortified with necessary vitamins and nutrients. The choices can be overwhelming and at times, confusing. Consult a Suncoast Pets Staff member to get an understanding of what best suits your needs.